Scientists have used in-vitro fertilization techniques to develop hybrid rhino embryos -- "test-tube rhinos" -- which could help save the endangered northern white rhinoceros species, according to a new study. The team was also able to extract stem cell lines from southern white rhino embryos, a closely related subspecies to northern white rhinos, which could be used to make reproductive cells such as eggs and sperm to create embryos. These techniques could become a valuable tool in the conservation of rhino populations, according to the research published Wednesday in the journal Nature Communications. 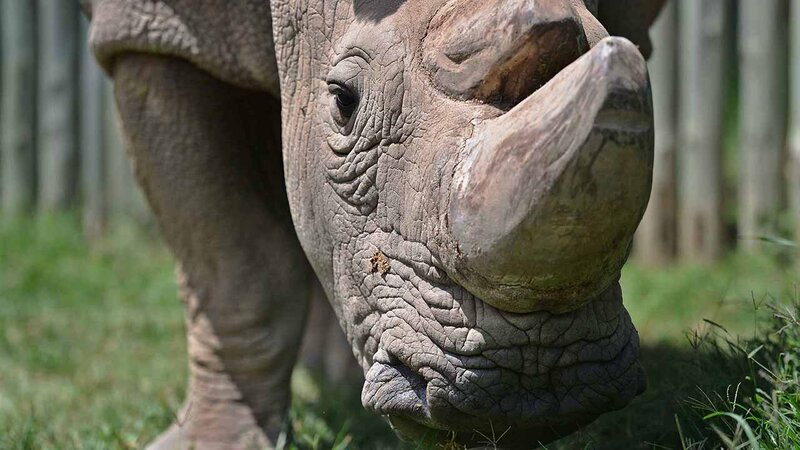 "It shows for the first time that modern technology can offer some options for conservation when the situation gets very bad, when species become endangered, such as the case of the northern white rhino," said Cesare Galli, who works at Avantea's laboratory of reproductive technologies and was one of the authors of the report. Over the past two decades, attempts at establishing a sustainable northern white rhino population -- including natural breeding programs as well as artificial insemination -- have been unsuccessful, according to Jan Stejskal, director of communication and international projects at the Dvr Králové Zoo in the Czech Republic, who was involved in the study. Recent efforts to repopulate the northern white rhino have been hamstrung by the fact that both Najin and Fatu are infertile, according to the study. However, scientists believed that assisted reproduction technologies used on equines could also be transferred to northern white rhinos as a way boosting their reproductive capacity, the study says. Among horses, assisted reproduction technologies have resulted in pregnancy 50% of the time, according to Galli. Using similar techniques, the scientists were able to fertilize southern white rhinoceros eggs taken from different females in European zoos with previously frozen northern white rhinoceros sperm, creating hybrid embryos. The procedure had never been attempted among northern and southern white rhinos, according to the study. The embryos have been frozen for possible implantation. "What we've done is very similar to what's done to couples with fertility problems," Galli said. "We've made a test-tube rhino." Embryo transfer -- or the use of a surrogate mother -- has never been accomplished in rhinos, according to Roth. Nonetheless, if successful, the goal is to create a population of hybrid rhinos -- both southern white and northern white rhinos. Several generations of intensive interbreeding would dilute out the southern white rhino genes, "getting us to the point where we basically have a 99% northern white rhino," says Terri Roth, vice-president of conservation and science and CREW director at the Cincinnati Zoo and Botanical Garden, who was not involved in the study. The extraction of stem cell lines from southern white rhino embryos was another outcome of the research, according to the study. By creating embryo stem cell lines from southern white rhinos, scientists demonstrated what Roth calls "proof of concept," meaning that if you could achieve this outcome with a southern white rhino, you could ostensibly achieve a similar outcome in the northern white rhino. It's a feat that, in theory, would allow the research team to produce sperm and eggs from the cells, which could then hypothetically be used to create northern white rhino embryos, according to Roth. In the future, they also hope to use frozen skin cells taken from 13 northern white rhinos to create induced pluripotent stem cells. These cells are adult cells, such as blood or skin cells, that are reprogrammed to act like stem cells. From these, sperm and eggs could be derived, which can in turn be used to create the embryo. The embryos could then be implanted in a surrogate mother, most likely a southern white rhino, to produce a northern white rhino. "The beauty of it is that we have a southern white rhino that is very closely related to the northern white rhino, and it's very likely that a southern white rhino could carry a northern white embryo to term," Roth said. However, because of the complexity around creating pure northern white rhino embryos, Galli estimates that it will take 10 years to accomplish. As more species slide towards extinction, the use of assisted reproductive technologies as a conservation mechanism has entered the spotlight. Many scientists see these technologies as a valuable tool in the repopulation of disappearing species. Artificial insemination -- an assisted reproductive technology -- has been used to produce offspring with 60 mammals, including the giant panda, black-footed ferret and Asian elephant, and 35 non-domestic birds. Yet the use of assisted reproduction for wildlife conservation is still rare, according to a paper co-authored by Roth, having been met with a lot of resistance from within the animal conservation community. For Galli, it's a a simple matter of using the best tools at your disposal. "Many people working in conservation are strongly against using biotechnologies, which seems crazy, because if you have the technology, why not use it for the good?" he said. Burgeoning new technology -- such as the methods used in this study -- may offer promising alternatives for conservation efforts, but technology is not a panacea for wildlife conservation, according to Roth. "The concern in the conservation community is that people will hear this and think, 'We can save the rhinos with science and then become more complacent about the other strategies we have in action now,' " Roth said. Roth doesn't believe that one size will fit all. Rather, she urges for multiple strategies -- including forest conservation, natural breeding programs, the use of rangers to guard against poaching and assisted reproductive technologies -- to be used in wildlife conservation. "We should be working on all fronts," Roth said. "It's very unfortunate that we find ourselves in this situation. I do think that if there's one thing we should learn from this, it's that we shouldn't allow species to get to such a critical state that these high-tech approaches are the only ways of saving its genes."